Sometimes in the summertime, it is hard to get a cold front to move far enough through the Mid-South to reap the benefits of drier air behind it, let alone cooler temperatures. We'll get our chance this week! A cold front will sink south through the region on Tuesday, arriving in the metro area in the early afternoon hours. Ahead of and along the front, rain chances will increase to probably no worse than 50/50, so many folks have a chance of getting some rain, starting very early Tuesday morning. By late afternoon, I expect to see storms, some of which will be severe, over north MS and moving south. The biggest benefit of the front will be a temporary reprieve from very humid conditions we have had for several days. 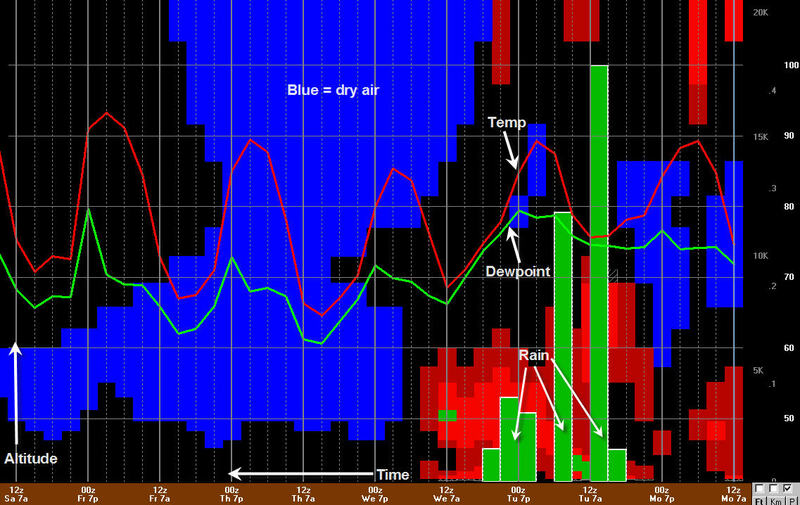 If you follow the MWN Blog much, you know that we talk a fair amount about dewpoint. Rather than speak of relative humidity, which only really has meaning when pairing it with temperature, the dewpoint is a great measure of the amount of moisture in the air. Lately, our dewpoints have been in the lower 70s, which is very moist (and sticky) air. Dewpoints in the 60s, especially mid 60s, is much more comfortable. Dewpoints in the 50s is indeed an unusual event during a Memphis summer. The graph below takes a little explaining, but it is a time cross-section at Memphis taken from the morning GFS computer model showing plots of temperature (red line) and dewpoint (green line), relative humidity (red, green, blue background), and rain amounts (green vertical bars). It is read backwards with the earliest time on the right and going into the future by reading right to left ( <--- ). The far left is Saturday morning. Altitude increases as you go up the graph. Anyway, a couple of things to point out. Notice the high temperatures (peaks in the red line) are lower in the middle of the week behind the front (then start climbing again my late week), but dewpoints also fall mid-week. It is indicating off and on rain from early Tuesday morning through Tuesday evening (which may be a little late as an end time). Finally, all the of the "blue air" starting Wednesday evening depicts a dry airmass, so there should be lots of sun/clear skies and the lower dewpoints during that time mean more comfortable air, even though temperatures will still be in the 90 degree range. Bottom line: drier and cooler air will exist after we get through tomorrow's thunderstorm chances and the front passes through. By the way, I didn't show it, but the heat and humidity return for the holiday weekend! Details in the MWN Forecast. A complicated scenario has set up for the rest of the day with regards to the chance of thunderstorms in the Memphis metro region. A Severe Thunderstorm Watch is in effect until 8pm tonight, but looking at 3pm radar imagery, one would think that the area would be in the clear for the rest of the day as thunderstorms move away into north Alabama. This may end up being the case, however a couple of atmospheric conditions exist that could come together to bring a few storms to the region. The first is a nearly-stalled outflow boundary from the storms to our east that is positioned across Tipton and Fayette counties (see radar image below). 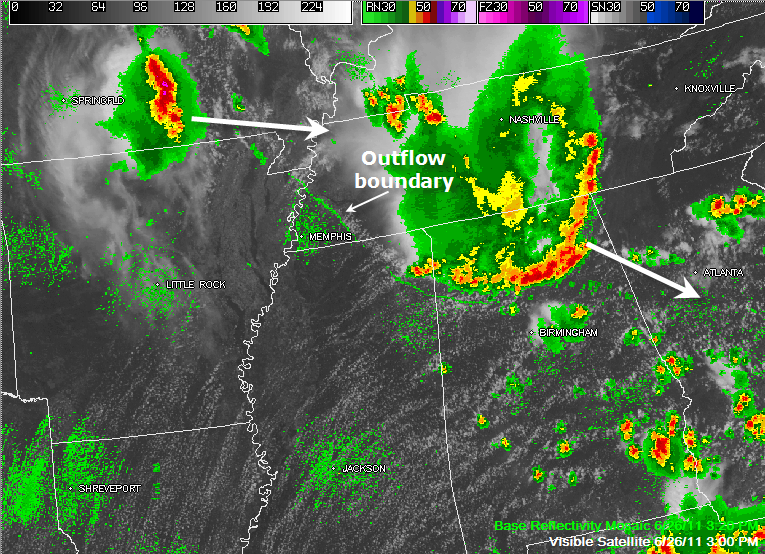 Typically in the summertime, a boundary like this is all it takes to spark new thunderstorm development. In addition, a cluster of thunderstorms in south-central Missouri is moving east-southeast. The storms in southeast Missouri are expected to hold together as they move into northeast Arkansas and northwest Tennessee. These storms could also produce an outflow boundary that could intersect the boundary over the metro area to produce thunderstorms. The primary threats with any storms that form will be damaging wind, though large hail and very heavy rain is also possible. The threat of tornadoes is almost zero. I expect any complexes of thunderstorms that form Monday to be well to our north as high pressure aloft caps off convection. A cold front on Tuesday will bring our next chance of rain after this evening. While the humidity has certainly been higher the past few days, cloud cover from distant (and some not-so-distant) thunderstorms have helped keep temperatures in check as we haven't gotten out of the 80s since Monday. The higher humidity and scattered mid-day thunderstorms the past two days have been the result of a cold front that moved into, but not through, the region. The front is still draped across the area and another weak impulse will move along it this afternoon. 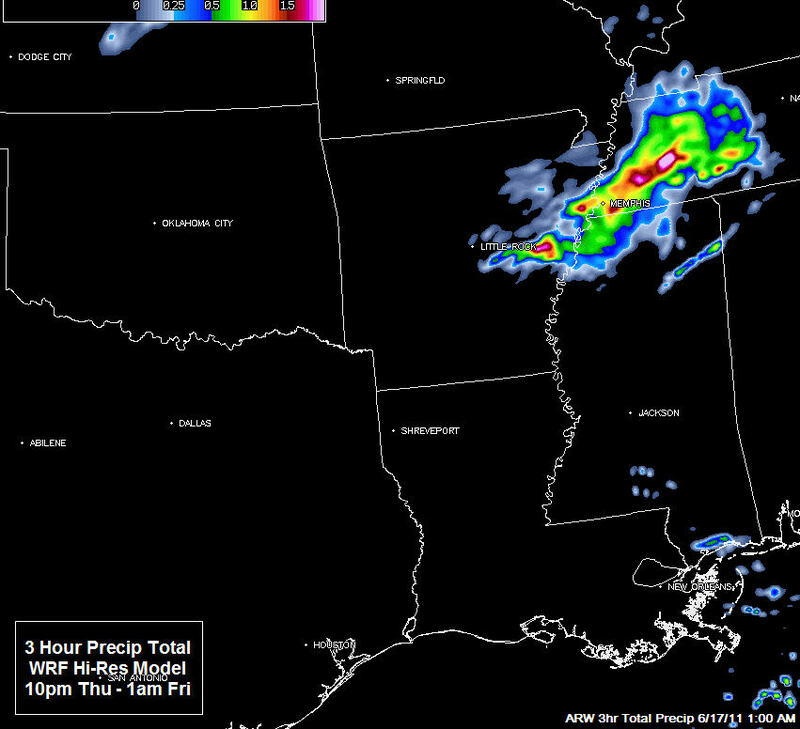 Morning high-res computer data is indicating the possibility of thunderstorms forming just south of the Memphis area, across north MS, this afternoon. A Slight Risk of severe weather is forecast for the possibility that some of these storms could contain hail or a high wind gust. In Memphis, I expect a partly cloudy day with slightly lower humidity and highs in the lower 90s. A few thunderstorms could pop up this afternoon in the metro, again mainly over north Mississippi. As the front starts to pull back to the north tonight and an upper-level ridge of high pressure begins building from the southwest, the Mid-South will be placed in a weak northwest flow pattern for Friday and Saturday. This was the pattern (although somewhat stronger) that brought morning t'storm complexes early last week (for more on this pattern, see this blog post from Monday last week). I believe there is a decent chance of this occurring again, the first of which could be overnight tonight. The most likely track for a potential complex will be from northwest to southeast AR, though there could be a few storms over east AR late tonight or early Friday. During the day Friday, outflows from these early day t'storms could initiate further development in the metro area, so a chance of thunder has been included in the MWN Forecast. In addition, a Slight Risk of severe weather is in place for the area on Friday, with damaging wind and hail being the prime threats. Yet another chance of thunderstorms exists Saturday, with models indicating the possibility of scattered storms developing over the region during the day in persistent northwest flow. By Sunday, the ridge to our southwest builds over the region and continues to dominate through at least the first half of next week. This will mean higher daytime temperatures, partly cloudy skies, and no mention of thunderstorms early in the week. Highs will reach the mid to upper 90s with heat indices well above 100 thanks to moisture streaming north from the Gulf of Mexico under the ridge. Check out the MWN Forecast, the most accurate for Memphis, for all the details. String of above normal temps could end as summer begins! Since May 28, the Memphis airport has had only one day in which the high did not reach 90 degrees (it was only 89 last Friday). In that stretch, the average high has been 94.5 degrees and the average low 73.5 degrees, for an average temperature of 84 (or about 7 degrees above normal). And it's not even summer yet! The summer solstice occurs tomorrow, June 21, at 12:16pm CDT, marking the longest day of the year and the "official start" of summer (though meteorological summer began June 1). It's hard to believe that with an average high of 94 degrees over the past 3+ weeks that summer hasn't even started, but it's true. The good news in all this is that it looks like summer may start with a return to more "normal" temperatures, which are a high of 90 and a low of 70. A slow-moving cold front will moves towards the Mid-South Tuesday night then stall over the area into the weekend. With more cloud cover and higher rain chances, especially Wednesday, we should see highs back into the 80s for a few days this week. Plus, with the front hanging around into the weekend, we'll be expecting some "summertime" thunderstorms Thursday through Sunday. Severe chances are not high, but we could see some storms pose a wind or hail risk on Wednesday before the front begins to weaken as it loses some momentum. Visit the MWN Forecast for complete details on this week's rain chances and temperature trends. I've posted in the past on the phenomena known in the weather broadcast community as "wall-to-wall" (or long-form) coverage, in which a local broadcast station (typically TV, though known to occur on radio as well) preempts all routine programming in order to keep the community informed and safe during a severe weather event. It's not a foreign concept to most in the Mid-South, especially after the spring we have just gone through. A couple of things prompt me to post again on the warning process and related matters: 1) a blog post by a well-known and respected broadcast meteorologist in Birmingham, James Spann, whom I greatly respect from afar, and 2) a Commercial Appeal article by James Dowd in this morning's (Sunday, June 19) Business section. I highly encourage you to read each one. The high false alarm rate in tornado warning situations has created complacency and apathy, and therefore inaction, on the part of the public. Too many people rely on sirens to warn them of a possible tornado and if they don't hear it, they aren't prepared. Sirens are out-of-date technology that, while at one time served a purpose, no longer do. NOAA Weather Radio will become obsolete unless it is upgraded to the polygon warning system currently in use by the NWS. If it doesn't get upgraded, the private sector will lead the public into the future of receiving warnings with technology. TV stations must stream their long-form (wall-to-wall) tornado coverage in a way that is accessible to all portable devices, not just some of them. Social media is a lifeline during severe weather and must be embraced by TV meteorologists. When there is a genuine tornado emergency, local broadcasters must go wall-to-wall to warn the public, and have the guts to take the hate mail. TV meteorologists need to get off their off-camera computers, get in front of the chroma-key, and look their audience in the eye. It is a key element of communication. Memphis TV meteorologists have to maintain a balance between "too little" and "not enough" when it comes to live coverage of severe weather events. Recent events in Joplin, Tuscaloosa, and elsewhere have prompted stations to "have their guard up" and viewer complaints are down, presumably because those events are fresh in their minds. It is preferable to have too much coverage in an event where all turns out OK than to not be on the air when disaster strikes. While re-running preempted programming at a later hour satisfies some viewers (depending on the program that was cut), advertisers are not as happy because they paid big bucks for certain time slots during certain programs. With the expanding use of mobile technology, all agree that it is only a matter of time before these devices will be used for weather updates more than television. I do not wish to comment again on the use, or lack thereof, of wall-to-wall coverage. My opinion has changed little and can be found in the posting I mentioned at the top of this page. However, I would comment on a couple of things that Spann and Dowd's articles touched on. I don't wish to go too deeply into this subject or take a hard-line stance on this topic. Many of my friends in the weather community are the men and women who are the unsung heroes at the National Weather Service that issue these warnings as a matter of "protection of life and property." Spann differentiates between the "squall line spin-ups" type of tornado (which frequently are brief, weak, and occur on the leading edge of intense lines of thunderstorms) and the supercell twisters which typically cause the greatest damage, most injuries, and highest death tolls. He takes on the squall-line cases directly, asking the NWS to stop issuing warnings for these brief spin-ups when, in most cases, they are near impossible to detect in advance and last only a few minutes. By the time the warning is issued and received, the threat is about over and broadcasters are left on the air for up to an hour for a tornado threat that no longer exists, or at least is overshadowed by the greater threat - the damaging straight-line wind in the squall line. He contends that these warnings desensitize the public. I won't go so far as to say that the NWS should stop issuing warnings for these types of "lesser" threats. However, Spann's point is well-taken. The high false alarm rates (FAR) when it comes to tornado warnings have created a complacent public that is probably more dangerous than an underwarned public. Without having spoken to NWS officials directly on the matter, I am fairly confident in stating that they are likely doing whatever it takes to make sure that they don't miss a tornado, at the expense of 80% or more of their tornado warnings resulting in no tornado (even if the conditions are right and the precursors are present in the specific storm). The damage control for a missed event has to be much greater than for an overwarned public. So, while I completely understand their position, the capabilities of the radars these days are allowing the individuals triggering the warnings at the NWS to "see" with even greater detail the precursors. This in turn has resulted in more warnings that don't verify (precursors don't necessarily mean actual tornadoes, or even funnel clouds). This should be taken into account during the warning process, as should the societal impacts of an overwarned, "siren-weary" public. The NWS stopped warning entire counties years ago and now issues tornado warnings for areas along the projected path of the storm - using what is called storm-based, or polygon, warnings. The technology exists for sirens to be programmed such that, if they are not in the polygon area being warned, they do not sound. I understand that the actual sound from these sirens may bleed over into areas that aren't warned, but I think that is a good thing. (If you are 1 mile outside the polygon, are you truly "safe" from the storm?) I also think that there should be a buffer around the polygon from a siren perspective, such that if the siren can be heard within the polygon but is not located inside the polygon, it should sound. Again, technology will allow you to do this. Also mentioned by Spann, I agree 100% with his opinion that NOAA Weather Radio must come into the 21st Century. The ability to only alarm for the county(ies) that are programmed is the first necessary step that was taken years ago. The next step, along the same lines as the discussion above regarding sirens, is that technology must be used to allow these radios to be alarmed based on their location within a storm-based warning. Why are weather radios going off in Collierville when the storm is in Millington? The federal government and radio manufacturers need to invest in the technology as a matter of public safety! Once again, private industry is leading the way with smartphone apps that will use polygon warnings and GPS to push notifications to users when they are in the path of the storm. NOAA Weather Radios should have GPS embedded in the device and the warning information that is disseminated should contain the actual area being warned, not just the county. Both articles commented on the rising use of social media in the field of weather, and particularly in the warning dissemination process. Obviously, if you know anything about how MWN operates, you know that social media is vital to our modus operandi. During severe weather, Facebook and Twitter are our means of nowcasting weather information to you. In other words, it's our version of "long-form" coverage. We were one of the first in the Memphis area to adopt this method two years ago and it has earned us high accolades and many thanks from our growing base of followers. The great thing about nowcasting on a social media stream is that, if you as a consumer of information do not wish to know about it or it isn't affecting your area, you can turn it off - surf to another website, hide the posts, whatever. We don't have to "preempt" anything else that you might wish to partake in. You can come and go as you please. TV broadcasters don't have this luxury (and I'm not delving into the digital x.1 and x.2 channels, which technically do give them a few options). Not only does social media give you an option on viewing the information, but it really can be an effective means of spreading the word quickly and efficiently. It is very easy to pass the information along and grow the number of consumers exponentially when needed. On broadcast coverage, if you missed the weatherman's statement about the communities in the path of the storm, you may be out of luck. Not so with social media - the re-tweet and share button allow the information to continue to be spread. 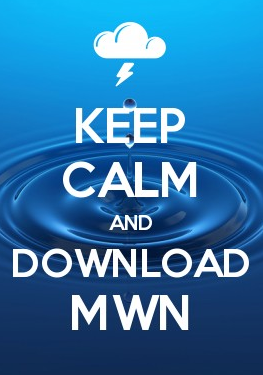 MWN sees social media as part of the future of information dissemination, which is why we adopted it early and use it often where weather is concerned. All of the above taken together - a reduced false alarm rate for tornadoes, upgraded siren and radio technology, continued evolution of new techniques in mobile technology from the private sector, and the use of social media - should result in a less siren-weary, more storm-ready public, and eventually a further reduction in injury and death during violent storms. What do you think? Feel free to leave your comments below! I read every one and am interested in your thoughts, particularly with regards to how MWN can play a role in your safety during severe weather. Since 1998, when it first became operational, one of the primary methods of receiving weather data directly from the National Weather Service has been the NOAAPORT satellite system. From NOAA (the parent organization of the National Weather Service), "the NOAAPORT broadcast system provides a one-way broadcast communication of NOAA environmental data and information in near-real time to NOAA and external users." As shown below, NOAAPORT basically consists of a satellite receive system in which multiple data types which originate at the NWS are uplinked to a satellite, then downlinked back to a properly-equipped ground station (satellite dish) for processing by the customer. Types of data that are transmitted on NOAAPORT include text data, such as forecasts, watches and warnings, satellite imagery, radar data, and computer model data. In 2005, the NWS completed a switchover to a scalable circuit technology called Digital Video Broadcast-Satellite (DVB-S), which allowed information to travel at up to 10 megabits-per-second (Mbps). In the past 5 years, the amount of weather information that is being sent over the NOAAPORT signal has increased such that the current "pipe" of 10Mbps is no longer large enough to support new data types that are ready to be distributed on NOAAPORT. 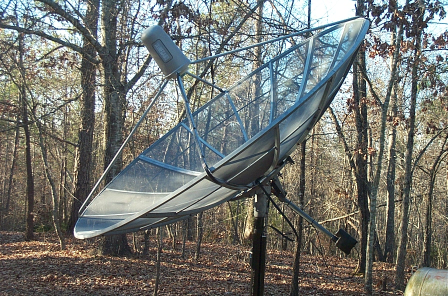 Thus, on Friday (June 17, 2011) at 7pm CDT, the NWS will switch off the current DVB-S feed and will begin using a new DVB-S2 feed, which allows data to flow at 3 times the rate (30Mbps) of the current feed. What will be the end result? The larger feed will allow new weather technologies like enhanced model data, next generation satellites that are coming online, and an ever-increasing amount of radar data (including the newest dual polarization products now in test) to be distributed to customers and vendors. This means that these weather vendors will then have access to the latest weather technology, which they can then pass on to the public! So, be watching in the next several months to years for new weather information to become available, much of it thanks to the upgrade of the National Weather Service's primary data distribution system - NOAAPORT. The Mid-South will have a couple of chances of thunderstorms over the next 12 hours or so, then a ridge of high pressure builds, bringing oppressive heat to the area for Father's Day weekend. The first of a couple of thunderstorm chances is developing now. At 1:45pm, StormView Radar is showing a few cells already popping over eastern AR and northwest MS. These cells should continue to develop as a stationary front lies just about over the metro area and temperatures in the 90s and dewpoints in the 70s contribute to a very moist and unstable atmosphere. Earlier today, a thunderstorm complex fell apart over the Ozarks of northwest AR, but a mini-low pressure system (mesoscale convective vortex) remains and is moving towards the region along the stationary front. 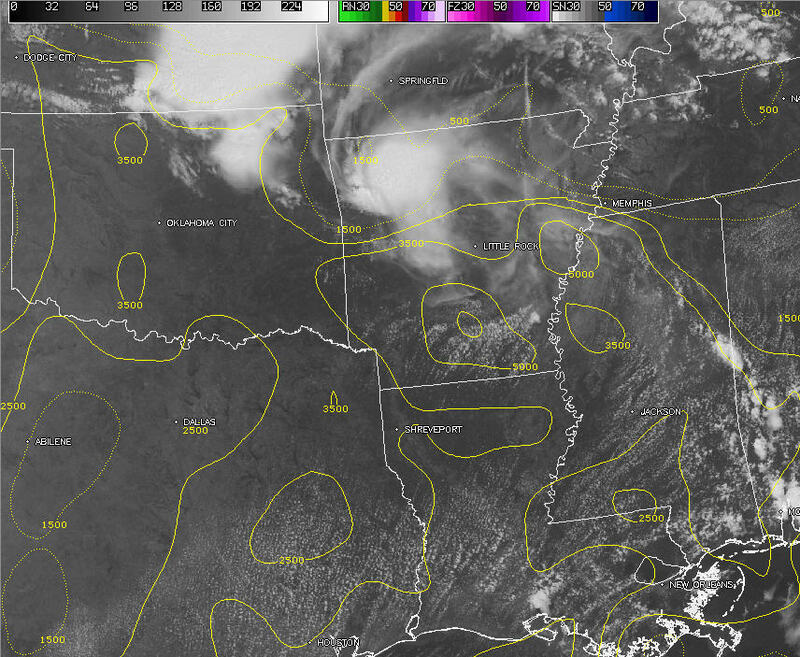 This MCV will be the catalyst for scattered thunderstorms. The image below shows the swirl of clouds over NW AR representing the MCV and the available energy in the region for thunderstorms (yellow lines). Basically, the MCV is moving into an area of high available energy, which should be enough to trigger storms during peak heating hours. The region is under a SLIGHT RISK for severe weather again today, with high wind possible, as well as large hail. These storms should weaken and move out this evening, but high-resolution model data indicate that another upper-level low will move along the front from southeast MO into the Mid-South, bringing another possible thunderstorm complex during the overnight hours. Even the traditional models are now coming on board with this solution, so don't be surprised to hear more thunder overnight. The model output below indicates the distinct possibility of storms somewhere around midnight. After the stationary/warm front moves north of the region by tomorrow, aided by a building ridge of high pressure, heat and humidity continue to build into the Father's Day weekend. In fact, the string of 90s will continue into next week, with 100 possible Sunday as the ridge peaks over the region. A pattern change looks to be forthcoming by the middle of next week, which could bring more cloudiness (and somewhat cooler temps) as well as higher rain chances. Details are available in the MWN Forecast. It's been one of those days. I understand, for many of you it's been worse than mine - you have suffered through power outages, property damage from the storm, trees uprooted or fallen on your home or vehicle, hopefully no serious injuries... Or maybe like friends of mine that live around the corner, your house caught on fire from lightning and you are now sifting through possessions trying to determine what is salvageable while contractors cut plywood and lay tarps over your roof... seeing that play out is how my afternoon ended. So maybe in the scope of things my day was not all that bad, but I do want to offer an apology to MWN's faithful followers for a few things that were - well - "sub-par" about our services today. The first was a lack of WXLIVE realtime current conditions from shortly after midnight until late morning. Fortunately, that was fixed fairly quickly once it was discovered. Next, it was discovered that our @shelbyalerts Twitter feed, which provides automated severe weather alerts for Shelby County, was not operational. This one I'm still working on and believe it has something to do with the software not playing well with Twitter. For now, it remains down, but HOPEFULLY will not be needed anytime soon. Finally, and most importantly, there has been an issue with StormView Radar that has prevented it from updating on the website and Android & iPhone apps since mid-day yesterday. At this point, it also is not fixed. Both of these last two issues are being worked by their respective software vendors. They are not issues I can directly resolve. The radar issue is the most disconcerting as it is a centerpiece of our product offering and, on the apps, has no direct replacement, nor a good way to let you know that it is down or why. The MWN Storm Center uses a different source for radar (albeit a much simpler version) that was not impacted. But I know (because I heard from a few of you) that you were disappointed in the lack of radar on the apps during the height of today's storms. I wish to offer my sincerest apologies for the sub-par service level today and the issues with some of MWN's products. I take days like these hard and can assure you that the level of service offered today is not acceptable. I will not only get the errors corrected, but more importantly, learn from them to hopefully prevent them from happening again. Providing high-quality products and outstanding service is the only way I wish to do business. I trust that you understand and accept an apology when service is less than outstanding. If you are reading this and are questioning the legitimacy of the app you paid for, please contact me directly via the contact form on MemphisWeather.net. I'll be happy to discuss it further with you and hopefully win you back. If anyone has comments or suggestions on ways to improve, feel free to leave them below. I read all feedback left. 11:20am UPDATE: A Severe Thunderstorm Watch has been issued for the area until 4pm. Storms are following the track forecast earlier this morning, now beginning to move out of southeast MO into northeast AR. Scattered storms are expected to move through the metro area this afternoon. Some of the storms will be strong and possibly severe, with the primary threat being damaging wind and a lesser threat of large hail. Tornadoes are not expected. Outline of thunderstorm watch box. Radar imagery valid at 11:20am. 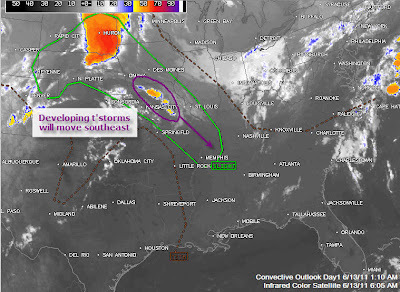 Visit the MWN Storm Center to follow this developing weather situation. The Mid-South is positioned in what meteorologists term "northwest flow" - meaning that the steering winds at mid and upper levels of the atmosphere are from northwest to southeast over the area. A ridge of high pressure is to our west, a trough is to our east and between those the wind is blowing from the northwest. Typically when we refer to northwest flow in this region of the country, we are looking at the possibility of storms that develop upstream (to our northwest) moving into the area. The graphic above shows what is happening early this morning to our northwest. 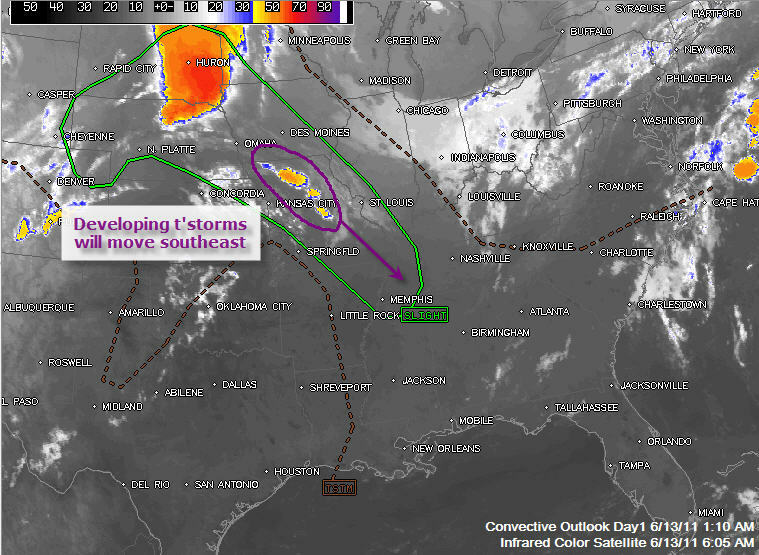 Storms are beginning to develop over Missouri and will move southeast on the "northwest flow." The Storm Prediction Center indicates that there is a Slight Risk of severe storms today downstream from these developing storms right into northeast AR and parts of west TN. While the chance of rain is not high today, we'll be monitoring this area of weather as it moves southeast to see if anything moves into the metro. This is called a "conditional risk" - meaning that if storms are able to form or move into the area, they could be strong to severe. The main threats with any storms will be strong gusty wind and large hail. MWN is forecasting most of the storms today to be to our north and east, as high pressure is ridging just enough into the metro area to keep the storms away. However, it bears watching. In the meantime, expect another hot day with partly cloudy skies, highs in the mid 90s, a very high UV index, and some humidity. Strong high pressure at all levels of the atmosphere has served up an extended heat wave over the past two weeks. Officially, we have seen 90 degrees every day since May 28 with no rain recorded. Unfortunately, extended range data indicates that the heat spell will continue for another week or maybe two, as strong high pressure continues to dominate. Every once in a while, a weak cold front will approach the region, which could bring slightly higher rain chances. The next of those arrives this weekend. On Saturday, high pressure weakens just enough to allow a front that has been sitting just to our north for several days to slide into west Tennessee. It will stall out over the area Saturday night before retreating back to the north Sunday. The map below shows the expected location of the front on Sunday morning. The presence of the front means a *slightly* increased chance of rain showers or thunderstorms, primarily during peak heating hours from 3-8pm each day. We'll cross our fingers that one of those rain showers is over your home! High temperatures this weekend are expected to remain in the mid 90s, however, so the front really doesn't bring much relief from the heat! High pressure builds back in Monday, though a possible convective system to our north could graze a portion of the Mid-South Monday morning. Dry weather is then expected for a couple more days before another front tries to sneak into the region. Check out the MWN Forecast for the specifics for the next week. MemphisWeather.net (MWN) and the Children’s Museum of Memphis (CMOM) are pleased to announce a new partnership that will provide information on local weather conditions and severe weather safety education to museum visitors. Using cutting-edge technology called Quick Response (or QR) codes, visitors to “The Tornado” and “The Perfect Storm” exhibits will have the ability to use their smartphones to scan a code near each exhibit. The scanned code will then direct the visitor to MemphisWeather.net’s mobile site and the MWN Blog to view current conditions and radar for the Memphis area. This will also allow visitors to read about how to stay safe in severe weather. If your business, attraction, or agency would like to partner with MemphisWeather.net, you may reach out to us via the Contact Page at MemphisWeather.net. 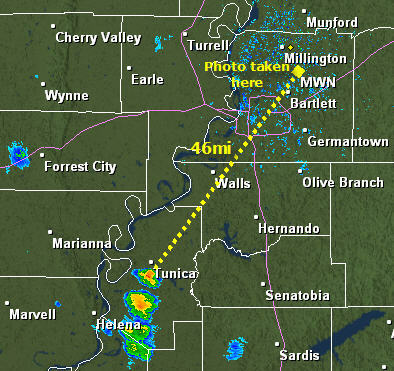 A couple of lone thunderstorms developed in the early evening hours south of Tunica and were visible from miles away as skies around them were mainly clear. 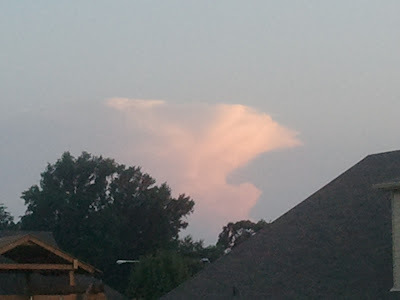 The photo above, taken from the north side of Bartlett just after 8pm CDT, shows the top of the storm as it weakens, with the sun setting to its west (photo was looking south-southwest). The radar image below, taken about the same time as the photo, shows the location of the camera and the storm - a distance of 46 miles apart! The flat top of the storm was at about 36,000 feet above the ground, which is why it can be seen from so far away. 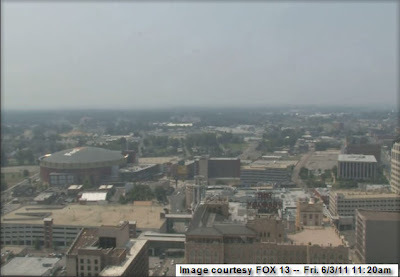 In addition, the fact that it could be seen from so far away indicates that there wasn't a lot of haze in the air. For those with some weather background, the 36,000-foot echo top lined up well with the forecast sounding for that time (01Z - shown below), which depicted an equilibrium level (point at which convection stops) of 37,000 feet. SBCAPE was about 1300 J/kg and MUCAPE was about 2200 J/kg. Light southerly wind throughout the storm environment meant a very slow northward movement to the cell and very little shear kept it from getting strong. Expect to see a few more of these isolated showers and thunderstorms in the afternoon and evening hours over the next couple of days, but they will definitely be few and far between as high pressure brings more heat to the Mid-South! Flooding and flash flooding occur every year in the Mid-South. River flooding occurs seasonally when winter and spring rains combine with melting snow upstream to cause rivers and their tributaries to overflow their banks. 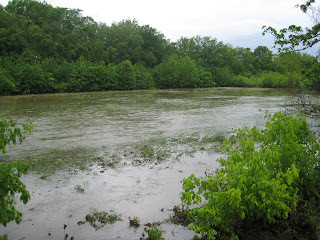 River flooding (such as we experienced in spring 2011) can occur over a period of weeks to months. Flash floods on the other hand can occur suddenly and are typically attributed to excessive localized rainfall. The flooding occurs within a few hours of the heavy rain. A Flash Flood Watch means that heavy rains could cause flooding in the specified area. Stay alert to the weather and have a plan in place should water begin to rise or a warning gets issued, particularly if you are in an area that has flooded before. A Flash Flood Warning means that flash flooding is occurring or expected imminently. If a warning is issued or water begins rising in your area, act quickly to exercise your plan and get to higher ground. Leave areas subject to flooding, including low spots, valleys, stream banks, and flood plains. Avoid areas that are flooded or have quickly-moving water. Do not attempt to cross a flowing stream where water is above ankle-deep. When driving, know the depth of water in a low spot before crossing. The road bed may not be intact under the water. Remember, "Turn Around, Don't Drown!" One foot of moving water is enough to lift and carry a car downstream. If your vehicle stalls, abandon it immediately and seek higher ground. Water may rise rapidly and engulf your vehicle and it's occupants. Do not camp or park your vehicle along streams or drainage areas, especially when thunderstorms are possible. Tornadoes are violent columns of rotating air that are produced by severe thunderstorms. 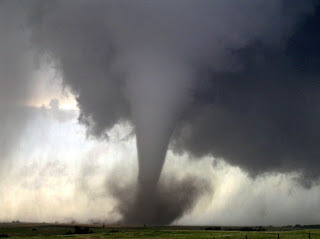 Weak tornadoes produce wind of 65-85 mph, while the strongest (such as the Joplin, MO tornado of May 2011), produce wind of over 200 mph and can be 1/2 to 1 mile wide or greater. Not all severe thunderstorms produce tornadoes, only a small fraction do, but people should be alert for the possibility if and when a Severe Thunderstorm Warning is issued. At home or in small buildings, go to the basement or storm shelter, or to a windowless interior room such as a closet or bathroom on the lowest level. Get under something sturdy such as a table or heavy bed. Abandon mobile homes and vehicles for a sturdy structure. In large buildings such as at school, shopping centers, hospitals, or factories/warehouses, go to the predesignated shelter area. Interior hallways on the lowest floor are best. Stay out of areas with high roofs or large roof spans, as they typically offer little to no protection from tornadic wind. At all times, avoid windows or large panes of glass. If outside and sturdy structures are not available, try to drive to the nearest sturdy structure for shelter. If one is not available, lie down in an area that is lower than surrounding areas (ditch or ravine if possible) with arms/hands shielding your head. When taking cover, have shoes on, photo ID on your person, cell phone (preferably charged in advance) with you, and crouch down and protect the back of your neck with your arms and hands. A Tornado Watch, typically issued for a large area such as many counties, means that conditions are favorable for the development of severe thunderstorms that can produce tornadoes. Stay tuned to NOAA Weather Radio or other commercial outlets for possible warnings and watch the sky for the possibility of developing severe weather. Have your plan ready should a warning be issued and be ready to exercise it. A Tornado Warning, typically issued for a small area in the path of a storm, means that Doppler Radar has indicated the likelihood of a tornado or a tornado has been sighted by trained spotters or law enforcement. If you are in the path of the storm, immediately find shelter using the rules above. A Tornado Emergency is not a warning type, but is issued (usually following the original Tornado Warning) when a large and destructive tornado has been confirmed and is moving into a populated area. The risk of destruction and fatalities is high and an elevated call-to-action is required. Everyone in the storm's path should immediately take action. For more information on the activation of outdoor warning sirens within the Memphis metropolitan area, please see this page if viewing on your PC or this page if viewing from a mobile device. 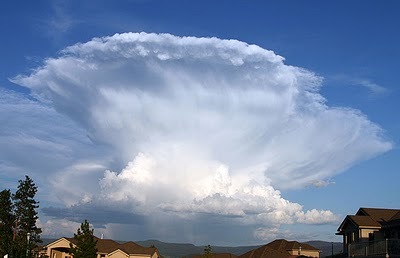 There are typically almost 2,000 thunderstorms in progress around the world at any given time. Only a small fraction (less than 1%) are classified as severe. Severe thunderstorms are those that produce hail at least 1" in diameter (quarter-sized) and/or wind gusts of 58 mph or greater. A small fraction of severe thunderstorms produce tornadoes, but all thunderstorms are capable of producing deadly lightning. The frequency of lightning or amount or duration of rain have nothing to do with whether a thunderstorm is classified as "severe." Severe thunderstorms can produce straight-line wind as strong as some tornadoes and can produce damage over a much wider area. Find shelter immediately. Go to a sturdy building that will withstand high wind. Avoid electrical appliances and corded telephones. If possible, bring your car inside a garage and secure loose objects. Tune in to local broadcast information or another trusted source to listen for any updates, including the possible subsequent issuance of a Tornado Warning. NOAA Weather Radio is the preferred source for all severe weather warnings. Incorporate the 30/30 Rule during a lightning storm, whether it is severe or not. If the delay between lightning and a subsequent clap of thunder is less than 30 seconds, seek shelter, then wait 30 minutes after the last thunder to resume outdoor activities. If on a boat, return to shore and seek shelter, at least in an enclosed metal vehicle. If caught outdoors during a lightning storm, avoid being the highest point in the immediate area and avoid metallic objects, including non-enclosed vehicles (motorcycles, bicycles, golf carts, farm equipment). Avoid lone trees and the tallest trees, as they could be the object struck. A Severe Thunderstorm Watch means that conditions are favorable for the development of severe thunderstorms, but none has been observed. Keep an eye on the sky and listen for subsequent warnings. A Severe Thunderstorm Warning means that a severe thunderstorm is occurring or imminent and has been detected by Doppler Radar or reported to the National Weather Service by a trained spotter or law enforcement agency in that area. Exercise the safety tips above. Hazy and hot will be joined by humid - and it's only the beginning of June! The Mid-South is in the throes of weather normally reserved for August as the 3 H's (heat, haze, and humidity) are combining to make things miserable across the region. The heat began last Saturday as we started a streak of 90-degree days that right now seems to have no end. 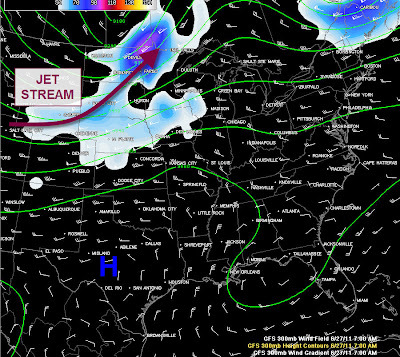 With a week of 90-degree weather and persistent high pressure aloft sitting directly over the Mid-South, hazy conditions have also joined in. Humidity has also been on the rise each day, but until today has dropped enough in the afternoons to keep the heat index near or below 100. As the humidity starts to climb though, heat indices will reach 105+ today through the weekend (at least). This has prompted the issuance of a Heat Advisory through 10pm tonight and we will likely see advisories continue through the weekend as high temperatures remain in the upper 90s into next week. Interestingly, the earliest 100-degree reading ever seen at Memphis International Airport was on June 6 in 1977. Though 100 is not in the forecast, there is a small chance we could touch the century mark this weekend. If we do that, it'll be the earliest 100 degree temperature ever in Memphis. 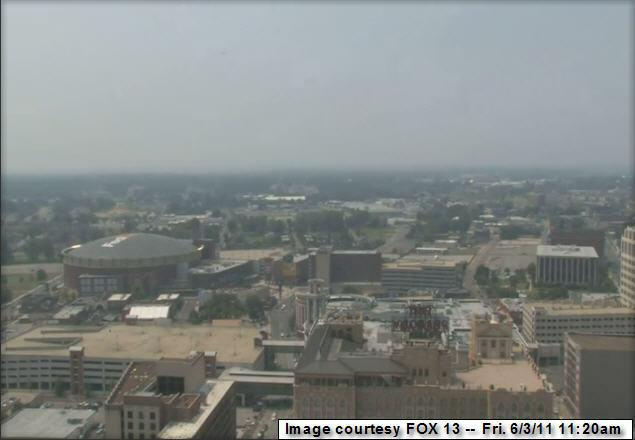 The hazy part of the 3H formula can be seen in the snapshot from FOX-13's downtown SkyFox cam shown above and is due to increasing levels of ozone and pollution trapped in the lower atmosphere under sinking air created by persistent high pressure overhead. Without much wind, the pollution sits in place rather than being dispersed. Ozone is chemically created from pollutants from cars, factories, and other industry reacting in the presence of sunlight and heat. It then becomes a pollutant (more on ozone basics). For today, the level of ozone is forecast by the Shelby County Health Department Air Quality Improvement Branch is high enough that a Code Orange Ozone Advisory has been issued. Code Orange means that the air is "Unhealthy for Sensitive Groups," including those with respiratory problems under normal circumstances (asthma, lung disease, etc.) and active adults and children and the elderly. 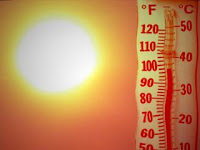 The Health Department urges everyone to reduce time spent outside and limit prolonged exertion, reduce trips and carpool, and schedule outdoor activities in the morning and evening, avoiding the hottest part of the day. As in April, May was again marked by multiple severe weather events across the region. The month started with heavy rainfall (nearly 7" at the WXLIVE! station in Bartlett on May 1-2), just as it did a year ago when a 500-year flood impacted west and middle TN. The last week of the month featured additional strong tornadoes with the highest-profile being the Joplin, MO EF-5 that killed 134. 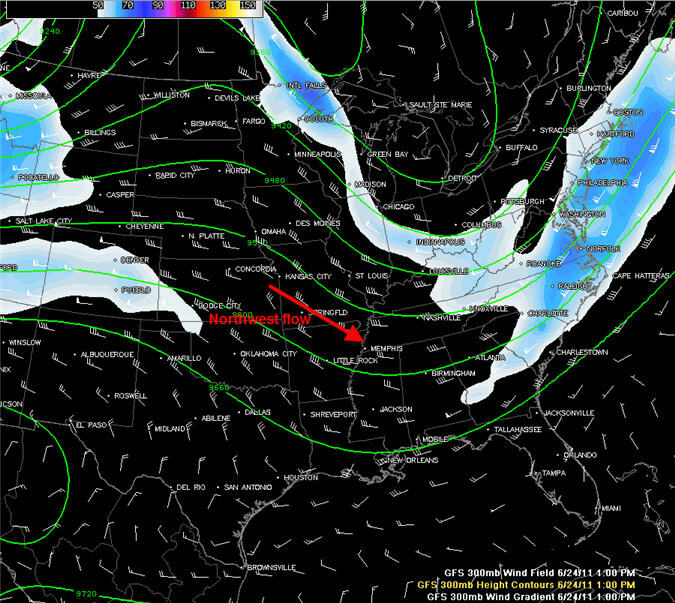 That system brought a high risk event to the Memphis area on May 25. A tornado-warned rotating supercell with pronounced wall cloud and picturesque beaver tail cloud passed over the north half of Shelby County with this system. Fortunately, damage was limited in the metro area. The most noteworthy event in the city in May was the vast Mississippi River flooding that took place. The river crested at 47.8' at the Memphis gauge on May 9, less than a foot from the all-time record set during the Great Flood of '37, and forced the relocation of the Memphis in May World Championship Barbecue Cooking Contest from flooded Tom Lee Park to Tiger Lane. The average May temperature was 70.2 degrees, which was 0.4 degrees below normal. 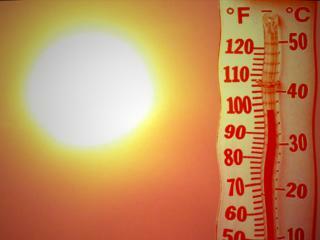 The average high temperature was 79.6 degrees and the average low was 60.9. The coolest temperature of the month was 46 degrees on the 5th and 17th and the highest temperature was 93 degrees on the 30th. 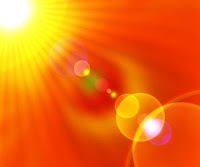 There were 4 days in which the temperature reached 90 degrees or higher. Precipitation for the month of May totaled 7.12", which was 1.97" above the normal of 5.15". There were 13 days with measurable rainfall (on 2 of those days more than an inch fell) and the maximum 24-hour total was 3.18" on the 2nd-3rd. The peak wind gust was 46 mph on the 25th during a severe thunderstorm with an average wind speed for the month of 8.9 mph. Click here for a daily statistical recap for Memphis International for May. The average temperature for May at the WXLIVE! station in north Bartlett was 69.0 degrees with a maximum of 93.6 degrees on the 31st and a minimum of 41.3 degrees on the 5th. May precipitation ended above normal with a total of 9.66", or more than 2.5" greater than at Memphis International. A co-located manual gauge used for the CoCoRaHS program measured 10.76". The peak wind gust was 46 mph on the 1st. Average relative humidity was a high 70%. Click here for a daily recap on MemphisWeather.net. For the month of May, the average temperature error in all MWN temperature forecasts was 1.71 degrees, lower than all compared computer models, including the National Weather Service, by nearly 10%. Over 78% of the MWN temperature forecasts for the month were within 2 degrees of the actual temperature. MWN's forecasts extend out five periods (or 2.5 days). For dewpoint accuracy, the MWN forecast beat all data sources, averaging 2.35 degrees error and falling within 2 degrees of the actual dewpoint nearly two-thirds of the time. Historical accuracy statistics can be found here.